JUNEAU — As legislators and Gov. Mike Dunleavy traveled the state last month, they heard from Alaskans upset about budget cuts and eager for a solution to the state’s financial crisis. Again and again, members of the public asked whether the governor and lawmakers will raise taxes on the oil industry or cut tax credits paid to oil and gas companies doing business here. Earlier this year, Democrats in the Alaska Senate suggested the oil and gas industry was being “held harmless” by budget cuts. To bolster their argument, they point to a line from a fall estimate that says the state is expected to pay $1.2 billion in tax credits to oil companies during the current fiscal year. Cutting those credits could eliminate the need to cut other things, they argued, and that message has been picked up by some Alaskans. In reality, experts say, the $1.2 billion program identified by Democrats functions more like a tax deduction. It’s not money being paid by the state, but revenue foregone to encourage investment. 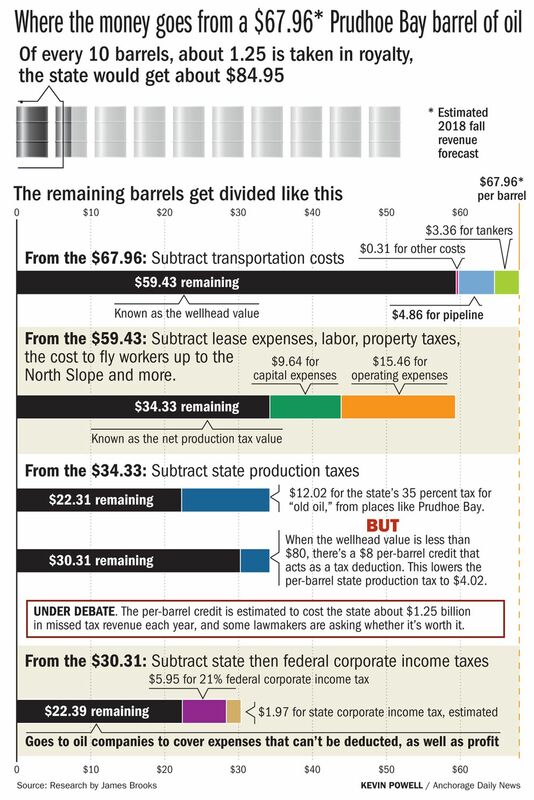 If the deduction were to go away, Alaska’s effective oil tax rate would soar. If the state wants to stay competitive and attract investment, proponents argue, it would then have to restructure its oil tax system. Thus far, the Legislature is unwilling to do that, and the reason is a mix of the political and the practical. Rep. Louise Stutes, R-Kodiak, said she’s heard plenty about the oil tax issue. Rep. Andy Josephson, D-Anchorage, offered a similar perspective. “I think there’s a lack of will to do it because the House is more moderate, the Senate remains supportive of the oil industry’s position, and the governor by all indicators would likely veto the legislation,” he said. If Gov. Mike Dunleavy is going to veto any change — and if it’s unlikely the Legislature can muster the votes to override that veto — it doesn’t make sense to spend time on the idea, Stutes said. “The environment is such that it’s not a good use of our time,” she said. Dunleavy press secretary Matt Shuckerow said the governor wants to see Alaskans vote on tax increases, and that includes oil taxes. To understand the issue, it helps to turn back the clock. At the time, oil prices were comparatively high, but there was concern that a 35 percent tax would be too high if prices dropped (as they eventually did). As an incentive for companies at low oil prices, lawmakers included what’s called a “per-barrel tax credit.” If the wellhead price of a barrel of oil is less than $80, producers can subtract $8 from the tax they would otherwise pay on that barrel. The credit decreases as prices increase: If the wellhead price is between $80 and $90 per barrel, the credit is $7. If it’s between $90 and $100 per barrel, the credit is $6, and so on until it disappears at wellhead prices above $150. In January 2015, Janek Mayer, an independent consultant hired by the Legislature to dissect oil taxes, explained that the per-barrel system might be labeled a credit, but it works more like a tax deduction. “Thinking about it as a credit in terms of money that’s somehow being handed back to companies is incorrect. This is simply a feature of the tax system that is intentionally designed to reduce the tax level at lower oil prices,” Mayer said. At current oil prices, members of the Senate Finance Committee were told last month, the state’s effective tax rate on oil from older fields is about 8 percent, thanks to the per-barrel credit. That’s by design: When SB 21 was passed, lawmakers wanted to depress the state’s effective tax rate at low oil prices in order to encourage companies to keep drilling here. “There’s only so many capital dollars and investment dollars to go around. It’s not limitless,” said Kara Moriarty, executive director of the Alaska Oil and Gas Association, a trade group that represents the industry. Senate President Cathy Giessel, R-Anchorage, says that means the per-barrel adjustment is important. Given the extensive changes to the budget proposed by the governor and the need for legislative attention on those changes, “this isn’t the time to be changing these fundamental tax policies,” she said. Tax breaks aren’t unique to SB 21. The state’s previous tax system had a 20 percent tax credit for things like roads and runways. That was costing the state about $1 billion in foregone revenue each year by the time it ended, according to contemporary accounts. The SB 21 system, including the per-barrel credit, is working, Moriarty said. Between 2008 and 2013, North Slope oil production declined by 169,000 barrels per day. After SB 21 became effective, the decline leveled out. Sen. Bill Wielechowski, D-Anchorage, disagrees with Moriarty. Wielechowski has been a consistent critic of the Senate Bill 21 system. In 2014, he called it a “screaming deal” for oil companies, and he hasn’t changed his perspective. Wielechowski has proposed legislation eliminating the per-barrel credit and doesn’t believe the state will become uncompetitive if it goes away. To a certain extent, he said, that argument doesn’t even matter when the state is considering severe budget cuts to fundamental services. “It is a choice between senior benefits and tax credits for the oil industry, and between education and tax credits for the oil industry … that’s literally the choice we have now," he said. “You can call it a tax credit, you can call it a tax deduction, you can call it whatever you want,” he said. “The reality is, it’s $1.25 billion less that we have in our treasury, and it needs to be fixed."